I have oil coming from between the top of the dryer and the controls. What would cause this? 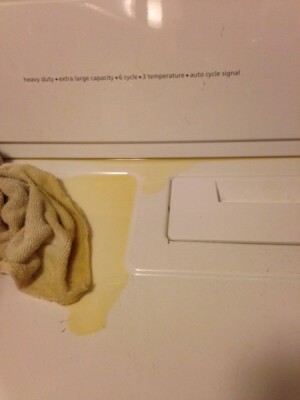 Are you positive something is not leaking down on it vs coming out of the dryer? Dryers these days use very little oil, it usually is not yellow, and none of it would be coming out of the top. What is above the dryer? It almost looks like cooking oil. Any chance it is from a cabinet above leaking down? Post back what you learn! There are no cabinets. No bottles leaking. I spoke to my repairman, he never seen this before. I'm going to check the ceiling. The repairman said to remove the control part. Only six screws. Will let you know what I find. Well, I am embarrassed and relieved. It was a bottle of fabric softener that was leaking. A tiny crack! It was two shelves above. That is awesome news! So happy you had an easy solution!